Peony's adopted Persian and Himalayan kittens from 2013 are featured on this page, as well as comments and pictures that have come from their adoptive families. Families are free to send pictures or give updates on their babies. We have a unique and special relationship with most of our adoptive families. We feel very blessed that our kittens have been adopted by these very special families. Enjoy their cute and sometimes very funny stories. You may click on the picture to see additional pictures of the kitten or view the slide show provided to see the kitten when it was growing up at the Cattery. You can click on the families pictures to enlarge the size of the picture. Jonah is a precious and sweet boy. He loves to run and chase with his brother and sister. You can watch him playing on our YouTube videos. You can view them on our YouTube Videos page. He has a lap cat personality but is still eager to play. He is very outgoing and friendly. He grabs at the hearts of all who meet him. He is a charmer. He loves to play but he is also a cuddler and loves, loves, loves to be held and loved. You can ask for a better combination in a kitten. He has very large blue eyes that are wide set apart. He has a borderline extreme face which is right at the bottom level of his eyes. He has a big coat factor which is probably almost on the equal with Buttercups (2009) coat. Dave and Lila with Jonah, Flame Point Himalayan. 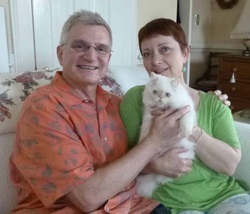 On August 18, 2013, our sweet cuddle bug, Jonah left with his new parents, Dave and Lila, for his new home in Cary, NC. It was sad seeing him go since he had become my desk cuddle bug. Jonah is going to a home with six other cats, including our own Solomon, renamed Toshi. Dave and Lila love coming to the Cattery to play with our litters and take some fantastic photography of our little ones as well as our grown ups. Lila called the next morning to let me know that Jonah had meet Toshi and Nikko and they were all relaxed and doing great together. Toshi had even taken up the big brother role. She also send some great photos which can be viewed below. Dave wrote us later that evening to let us know how Jonah did today, his first full day in his new home. Here is what he wrote: "Jonah was dying to get out and about this afternoon, so we let him roam. He flew all around, purring and trilling everywhere. Toshi followed him everywhere. I think those two sense they have a family connection. And Nikko keeps coming around to welcome him as well. The other cats just watch him fly by ;-) No one seems concerned. Just another brother, I guess! I have a few pictures from last night, but I haven’t processed them yet. Jonah is now sleeping beside Lila’s chair in her office." And here is what Lila wrote on August 19th: "Well, the peaceful existence of the kitten isolated in my office came to an end about 5:30 last night. After having slept most of the day, he woke up bright-eyed and bushy-tailed and started screaming and crying to be let out. As you said - once he started running it was like,"You can't catch me, I'm the Gingerbread Man!" He ran all over the house, up and down the stairs, around the downstairs and made his funny squealing noises the whole time. At this time, he hadn't yet made the acquaintance of Dexter and Cedric. Dexter is like a slow-moving vehicle and just watched Jonah run by without registering any reaction. Cedric was lounging on the kitchen counter and was not in the least disturbed when Jonah flew up and sat beside him. As Jonah ran around to discover the wonderful toys he hadn't seen yet, the others joined in the fun. Everybody stayed around him to watch what he did. Toshi almost never leaves his side. It's hilarious to see him trailing after Jonah - they really do look like Scooby Doo and Scrappy Doo! Jonah is pooping, peeing and eating just like he's supposed to do. He's eating both the YA and Flint River Ranch dry with gusto and a little of the FF turkey morning and evening. He went right to the litter box inside the big plastic bin and pooped this morning - smart boy! After he had his breakfast and had made a whirlwind morning tour of the house, Jonah went in Dave's office and sat in the antique chair next to the desk, right in front of the window, very content. I can't wait to see what he does tonight." You can see more of Jonah in Peony's Nursery 2013. You can read more about Jonah's miracle delivery on Our Cattery Blog for May 4, 2013. We are so thankful that Jonah and his two siblings made it through the horrible circumstance of their birth, no thanks to an unethical Vet. These three siblings are truly happy and healthy miracles.